Choosing the right bike frame size is extremely important for your overall comfort when cycling as well as for reducing the risk of injury and preventing long-term wear and tear on your body. Unfortunately, many cyclists are not aware of the importance of getting the right size, and only find out that their bike isn’t quite right when it’s too late. This guide will talk you through how to choose the right bike size for your body using three easy steps. 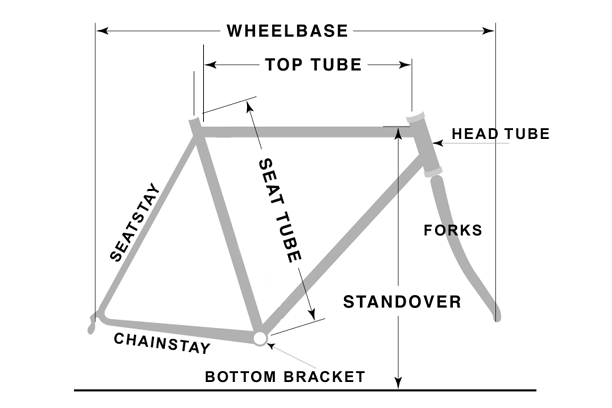 Knowing your size and measurements is an integral part of choosing the correct bike frame size, yet many cyclists are not aware of how to take their measurements correctly. To find the right bike size you’ll need to know your height and inseam measurements. Most people will know their height in either feet or centimetres, however few people will know their inseam. The inseam measurement is the most important of the two. Don’t base this measure on your trouser size; you want to be as precise as you can be. Stand straight with your back against a wall and your feet hip-width apart. Use a book to mimic your bike seat by placing it between your legs, against the wall. Have a helper measure the distance from the top of the book (where your crotch is) to the floor. This is basically what you’re doing when you’re trying out a new bike: standing over the bike with just enough space to be standing on the ground with both feet. This is also called your stand-over height (see main image). Stand-over height is measured from the ground to the top of the top tube and the theoretical perfect height for you is your inseam plus 2-4 centimetres. This extra gap will give you just enough space to be able to jump off the saddle without hurting yourself on the top tube. Bicycles are measured by the length of the seat tube, from the centre of the bottom bracket to the seat tube. However, this might vary slightly from one manufacturer to another as some frames are measured from the middle of the top tube. Some top tubes are horizontal whereas others are not which complicates matters even further (see image above). The length of the frame will increase in line with the frame size (which is based on the height), but the length will also differ depending on the brand or manufacturer. 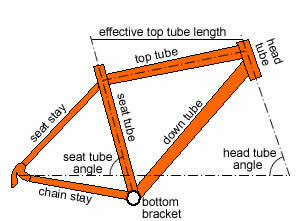 An important, and often overlooked, measure is the top tube length. You may have long legs and a short torso (or vice versa), which means that you’ll be leaning into the handlebars too much, causing unwanted tension in your neck, shoulders and lower back. At the same time, bike frames differ depending on the brand so you may find one particular manufacturer’s frame size more comfortable than others. Try out a few to find out what you need. To calculate your ideal top tube length, use the following method: Get a helper to measure the length of your torso and your arms and add these two numbers together. Then divide that number by two and subtract six. This will give you the top tube length in inches. To convert this to centimetres, multiply by 2.54. To find the length of your torso, measure the distance from your groin to your jugular notch. Your jugular notch is the soft dip in your neck and your collarbone. Your arm length is measured from your collarbone to the centre of your palm. The two charts below will give you a good idea of your ideal bicycle size. Note that some height and inseam intervals overlap – you may be on the border of two frame sizes depending on your measurements. Bicycle sizing is an art and a science – at the end of the day you will have to try out a couple of sizes to find out what feels right. 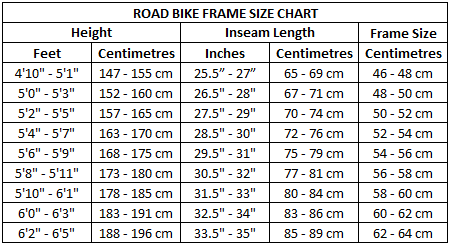 These charts will give you a good grasp of what your correct frame size is. However make sure you also have a look at the manufacturer’s own sizing chart when you’re in the shop. On that note, we’d always recommend doing your bike shopping in a physical bike shop rather than online so you can try before you buy. When you’re shopping for a new bike it’s easy to get excited by the look and feel of a new bike and the associated accessories, however the most important thing is that your bike is the right fit for you. I learned this lesson the hard way when I first started riding long distances on a regular basis. When I bought my first road bike, the guy at the bike shop was very busy telling me how cool I looked on the bike (it was a nice looking bike) and I now know that he didn’t spend enough time on making sure the bike was the right fit for me. Although it is important to know your frame size and body measurements, make sure you apply some common sense before buying a new bike. If it doesn’t feel right on your test ride it’s not going to feel right in six months. Be aware that the frame design can have a big impact on your comfort on the bike. Bike frames will vary in size and length depending on the model or manufacturer so it can be worth getting some advice from a professional bike fitter before you purchase a new bike. Try out a few different models before you commit. The frame size is not the only factor in finding the right bike size. Having the right frame size is fundamental to having the correct setup, but your saddle, handlebar and cleat positions also need to be right for you to enjoy your time on the bike. Make sure you understand whether your seat, handlebars and cleats set up correctly. Having your bike fitted to your personal measurements and body quirks is essential to your comfort on the bike and an important part of injury prevention. Many cyclists avoid professional bike fits because of the price tag, but you can end up with the wrong bike and niggling injuries without it. A good bike fitter will measure your body length, proportions and flexibility and detect any imbalances in muscle strength or build (most of us aren’t perfect human specimens). They can advise you of what frame measurements you should be looking for before you make your purchase, which can save you a lot of money and hassle in the long run. 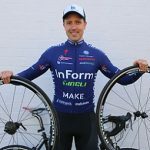 The articles below will give you an insight into our experiences with professional bike fits – in our opinion it’s definitely worth the money.